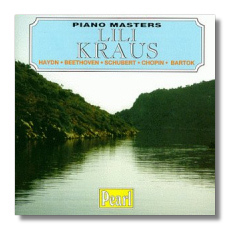 Ludwig van Beethoven: Variations and a Fugue on an Original Theme in E Flat Major "Eroica"
Born in Budapest in 1903, Lili Kraus soon made her mark as a classical pianist - in fact, she was only 22 when she was hired to a full professorship at the Vienna Conservatory! Even in her 20s, she continued to grow as a musician: she studied with Artur Schnabel, and established herself as a chamber musician by performing extensively with violinist Szymon Goldberg. In the 1930s, she lived in Italy and traveled to England to perform and to record the material presented on this CD. Then, while on tour in Indonesia in 1940, she was arrested on false charges and spent two years in a labor camp. A Japanese conductor interceded for her release, but it wasn't until 1945 and the end of World War Two that Kraus could get her personal and musical life back on track. Finally, she made her U.S. debut in 1949 and spent the following decade busily making up for lost time in the concert halls and recording studios. One of her major projects from the 1950s was to perform and record all of Mozart's piano concertos and sonatas. Late in her life, she became artist-in-residence at Texas Christian University, gave many master classes, and was a regular juror at the Van Cliburn International Piano Competition. She played in public as late as 1982, and died in 1986 at the age of 83. Kraus acquired the reputation of being a specialist in the music of Mozart and Schubert, but her career, particularly the earlier part of it, had an impact on many parts of the Classical and Romantic repertoires. Several of Kraus's Vox and Vanguard LPs have been reissued on CD. This is an important release, however, because it goes beyond Mozart and Schubert, and also because the young Kraus could be a fire-breather, a quality less apparent on her later recordings. On these Parlophone recordings, she is a thrillingly assertive pianist, only "ladylike" in the sense that she brings impressive poise and proportion to this repertoire. She plays with crystalline clarity, and her obvious enjoyment of the music is passed along to the listener even through the noise of the 78-rpm records (which is hardly a barrier in these excellent transfers). The Beethoven "Eroica" Variations, recorded in 1939 are this disc's highlight; Kraus finds the profundity and the humor in Beethoven's terse inspiration. The other selections on this disc are Haydn's Andante and Variations in F minor, a collection of Schubert's Ländler and Valses nobles, Chopin's Second Impromptu and Fourth Prélude, and Bartók's Three Rondos on Folk Tunes and Six Rumanian Folk Dances. There's not a moment of half-hearted musicianship among them. Kudos to Pearl for making these largelyforgotten recordings available again.